INTERESTING TIDBIT: Hairs expand up to 33% when soaked in warm water, making shaving easier. Build an attractive net worth through publishing. Start from home with minimum investment. Be in charge of your own business. Tidbits affords the opportunity for you to capitalize on your sales ability, and allows you to build an attractive net worth through a publishing concept that will be well-received in your community. You may start from your home or a small office with minimum investment. Headquarters will provide the editorial content of your publication – allowing you time to devote to your customers and growing your business. After a few weeks, people will stop you on the street and ask: “Are you the one who publishes Tidbits?” They will line up to get copies of new issues as they are delivered. After a year or so, your paper will be the talk of the town. Your readers will be hooked. More important: You will be in charge! You’ll find Tidbits in places where people wait: restaurants, doctor’s offices, hospitals, car repair centers, delis and places where folks sit around and have a cup of coffee. News in Tidbits is always fun and passed around from person to person. Everybody loves Tidbits! A “tidbit” is defined as “a tasty morsel to be enjoyed before the meal”. 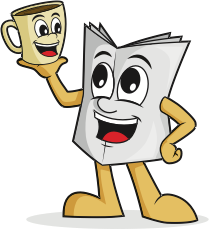 And that is what Tidbits® is – a non-controversial, weekly newspaper dedicated to publishing entertaining morsels for the mind, food for thought as it were: trivia, fun facts, amusing stories and oddities. You are not alone. That is one of the benefits of owning a local Publishing License of a national media company like Tidbits. Through more than twenty years’ worth of first-hand knowledge gained from the expertise (and sometimes costly mistakes) our licensees have experienced, our system has emerged as a proven method through which entrepreneurs may achieve success. 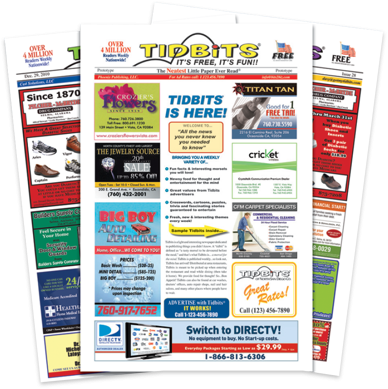 These are just a few of the many benefits of becoming an exclusive Tidbits® newspaper publisher. Think about it: Isn’t it time you made money for yourself instead of someone else? Spent more time with family and friends? Perhaps even “fire your boss.” It is up to you: Take charge of your future! We are ready to help make your dreams come true. If you would like more information on starting a Tidbits get in touch and someone will get back with you as soon as possible. We look forward to hearing from you. © Copyright 2019 Tidbits Media, Inc.